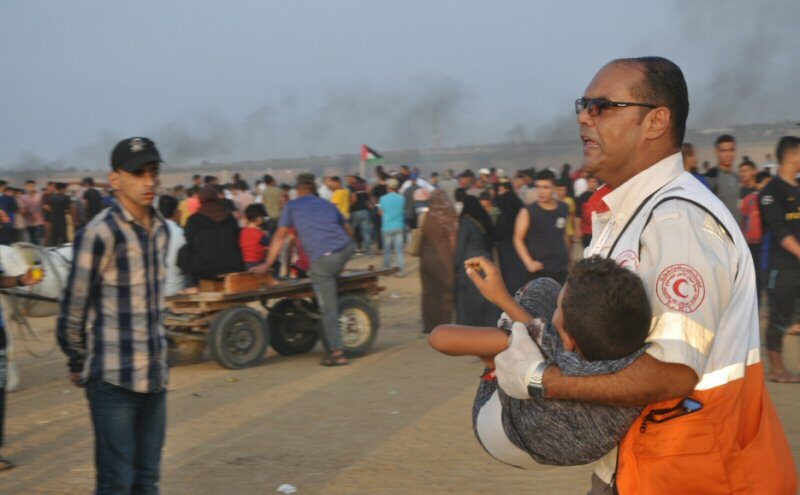 Ashraf Mousa Jom’ah al-Wawi (38), a paramedic at PRCS in Rafah, from al-Brazil neighborhood, south of Rafah, said to PCHR’s fieldworker that at approximately 16:30 on Friday, 31 August 2018, he headed to the border fence between the Gaza Strip and Israel, east of al-Shawkah village, east of Rafah, to practice his work in offering medical treatment in the March of Return and Breaking Siege activities along with his colleague and the ambulance driver ‘Adel Qeshtah. At approximately 17:45, while Ashraf was in the southern area of the Return encampment on Jaker Street, 300 meters into the west of the border fence, he saw a volunteer paramedic wearing a white coat on the ground as she was about 2 meters near the ambulance. Ashraf headed towards her and noticed blood on her chest and back. Ashraf and his colleague carried her and put her on a litter and moved her to the ambulance. They then offered her first aid and then took her to the medical point in the Return encampment. The paramedic was conscious and informed the ambulance crew that she is a volunteer paramedic and her name is Shurouq Fawzi Abu Moshameh from Khan Younis. After that the paramedic ‘Adel Qeshtah called for doctor ‘Atef al-Hout (Director of Abu Yusuf a-Najjar Hospital and Chairman of the Emergency Committee in the Ministry of Health in Rafah) to examine the health condition of Shurouq. After medical examination, Doctor ‘Atef asked the ambulance staffers not to take her to the medical point and escorted her to Abu Yusuf al-Najjar Hospital in Rafah due to her serious health condition. 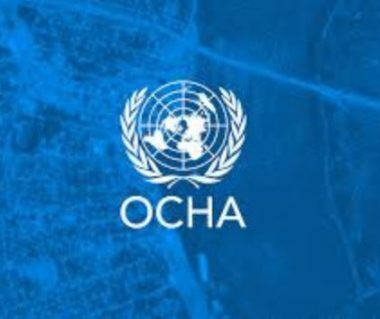 Jerusalem, 5 September 2018: The UN Office for the Coordination of Humanitarian Affairs (OCHA): This week, final stocks of emergency fuel will be delivered to critical facilities in the Gaza Strip, through the United Nations-Assisted Emergency Fuel Program. The Humanitarian Coordinator, Jamie McGoldrick, has written to the donor community requesting immediate support for the program, which provides life-saving emergency fuel to operate standby emergency power generators at critical health centers, and water and sanitation facilities in the Gaza Strip. Funds donated thus far in 2018 have been depleted. “If new funds are not received immediately, we will be facing a potentially catastrophic breakdown in essential service delivery,” said Mr. McGoldrick. “Services provided at hospitals, clinics, as well as sewage treatment, water and sanitation facilities will cease. Some hospitals are already within a week of closing. Hospitals in the Gaza Strip only have enough fuel to support service provision just over two weeks, in total, with some facilities at greater risk: Al Aqsa Hospital in the Middle Area of the Gaza Strip, for example, only has enough emergency fuel to sustain services for just under a week, putting the lives of over 500 vulnerable patients at risk each day. These include patients being treated in intensive care; new-born babies in neonatal units; patients requiring emergency surgery; dialysis patients treated for kidney failure; and those needing emergency care. More than 4,800 patients in Gaza daily require access to lifesaving or life-sustaining health care that requires a constant supply of electricity. Of these, at least 300 are connected to life-saving medical machines such as ventilators, dialysis machines, incubators and anesthetic machines, where disruption or electricity cut-out puts patients at immediate risk of brain damage or death.